oPOP3 collection from a catch-all mailbox at your ISP. oPOP3 collection from individual mailboxes at your ISP. oSMTP collection from a mail queue at your ISP. oPermanent incoming SMTP mail feed. The pros & cons of each method will be mentioned in the section for each type. 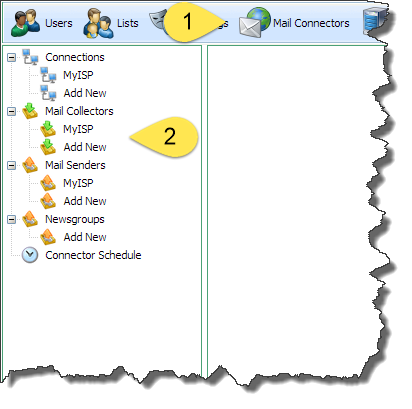 For all of the above methods apart from the permanent incoming SMTP mail feed, you need to have a Mail Collector in VPOP3. 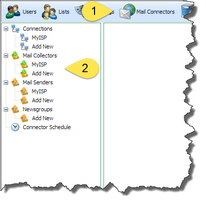 You can see and manage the Mail Collectors by clicking on Mail Connectors on the top bar in the VPOP3 settings, then looking at the Mail Collectors section in the tree menu at the left of the page. To add a collector, click on the Add New item in the Mail Collectors section. To delete a collector, select it, then press the Delete button at the top-right of the collector settings page. In all versions of VPOP3, apart from the Home User version, you can have as many mail collectors as you want. Before you can create a mail collector, you must have at least one Connection method defined, to tell VPOP3 how to connect to the Internet. If you have run through the VPOP3 Setup Wizard, the initial Connection method will already have been created for you.